The Riverside York Self-cateringThe Riverside is a 5 star river fronted Victorian townhouse in the centre of historic York. Generously spread over three floors, the accommodation includes three double bedrooms (one en-suite and one with twin beds option), a modern family bathroom and further cloakroom, a spacious sitting room with wonderful views over the river and a modern dining kitchen stacked with appliances, cutlery, crockery and cookware. Local facilities include a health spa (400 metres), gym (500 metres) and many restaurants and bars. Local tourist attractions include Clifford's Tower (200 metres), Castle Museum (300 metres), Jorvik Viking Centre (300 metres), Dig (600 metres), York Minster (1 km), Grand Opera House (200 metres), Theatre Royal (1km), City Screen Cinema (600 metres). Children welcome from any age. The Riverside York offers weekly bookings starting on any day and sometimes short breaks. Great location to walk into the centre. 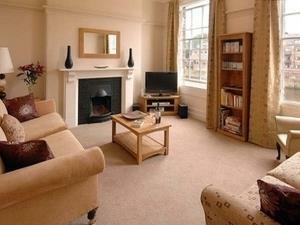 Beautiful house immaculately kept and well equipped for a self catering break. Allowing for the number of guests it can sleep it was good value. Hosts were friendly and helpful.